Here's some trivia for you – did you know (as of 2017), only six states require seat belts on school buses? This may seem unsafe, but let's look at the facts. According to the American School Bus Council, children are about 70 times more likely to get to school safely if they take the school bus, instead of traveling by car. However, many organizations endorse the use of seat belts in buses, including The National Safety Council and The American Academy of Pediatrics. Although the National Highway Safety Traffic Administration (NHTSA) agrees that school buses are safe, they also believe that three-point restraint systems can make school buses even safer. Child safety restraint systems are national mandates on buses when the bus weighs less than 10,000 pounds. These buses require a shoulder/lap belt. However, such buses comprise only about 20% of the nation's school bus fleet. 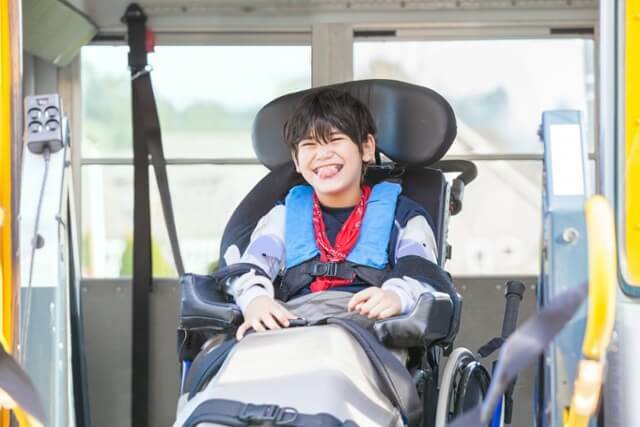 The large school buses should have a Child Safety Restraint System (CSRS) if the state or district requires them – but it's not federally mandated. What About School Bus Safety for Younger Children? Safety restraint systems for children in these categories must meet certain requirements - a simple lap belt is inadequate. Below, we’ll discuss several different types of CSRS's for different needs. A rear-facing child safety restraint system is required for transporting children two years old and younger, and is typically installed with a lap belt or LATCH (Lower Anchors and Tethers for Children) system. The seat should be installed at a 45-degree angle (following car seat instructions), and have harness straps and a chest clip. The child should occupy a rear-facing seat until they reach the minimum recommended age, weight, and height limit of a forward-facing seat. If you’re wondering if your child is truly safe, the NHTSA has some helpful best practices for infant and young child seating on buses. The CSRS for children over the age of two requires the child faces forward and sits upright. Just like the rear-facing seat, forward-facing seats also have harness straps and a chest clip. The child should use this seat until they reach the seat's recommended weight and height limits, or until the child’s ears are above the top of the seat. These are seats with built-in restraint systems which have both harness straps and chest clips. The child should use this seat until they outgrow the height and weight maximum, or until their shoulders are above the top harness slot of the seat. An add-on seat may be fitted to an existing school bus seat. It has harness straps and a chest clip. The child can use this seat until they outgrow the height and weight maximum, or until their shoulders are above the top harness slot. It's important to note that an add-on seat can only be used if the seat behind it is either empty or contains a child in another CSRS. Lap belts are appropriate for older children who don't fit into the above-listed CSRS categories. However, it is important to remember that they do not provide protection for the upper body (spine, neck, and head).